The TULA Arms Plant in Russia has been a major manufacturer in the ammunition industry since it was founded in 1712 by Peter the Great. Although it has been in the ammo production field since the 1700's, the plant has also produced multiple types of Arms for sporting and military purposes. TULA manufactures different ammunition types for the AK47, for the AK74, for the Mosin Nagant, and so on. 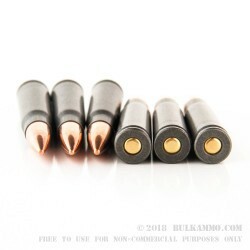 They are well-known for their steel cased ammo that is reasonably priced and reliable in the Kalashnikov platform. 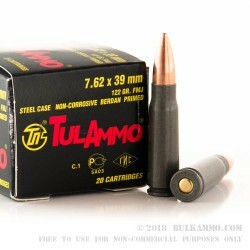 These Tulammo cartridges have a 122 grain Full Metal Jacketed solid lead core bullet loaded into a non-corrosively Berdan primed, thick-walled, tough, steel case with a lacquer coating. They have a case pressure rated at a maximum of 39,800 PSI, or pounds per square inch. Their muzzle velocity is 2,396- feet per second of speeding, hard hitting 7.62x39 power. 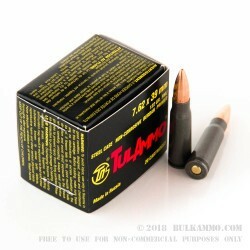 They come in the easy recognizable black Tulammo 20 round boxes and are sold by the case as well. Stock up your personal armory full of this Russian powerhouse and you'll be ready for your next trip to the range, or for your next shooting competition. Get yours today. Reliable at a very good price. 11 out of 20 did not fire. 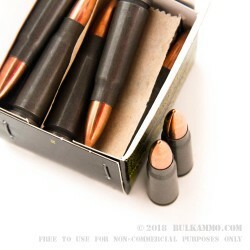 Q: Are these casings reloadable? A: No, these Tula steel cases effectively cannot be reloaded. A: AKs in military service around the world generally use steel cases - there is no problem with this. These Tula cases have a polymer coating which helps protect the steel case.